It takes thousands of years to naturally build just a few inches of fertile soil. Wednesday marks the 5th annual celebration of World Soil Day. Organized by the Food and Agriculture Organization of the United Nations, it’s an opportunity to recognize the importance of maintaining the health of the delicate ground that our whole civilization is built on. Like so many other natural resources, we don’t tend to think much about soil until there’s some sort of shortage or problem with it. In a technical sense, soil is renewable. Which is to say that if it’s been damaged, it can be repaired. But not nearly as quickly as its being depleted. “It takes about a thousand years to build an inch of soil," says Dr. David Ianson. He’s studied soils extensively and holds a Ph.D in plant pathology. Now, he’s a soil conservationist for the Natural Resources Conservation Service office in Kenai. A lot of his work has examined soil conditions around other natural resource development like coal mines, that drastically change the chemical makeup of soils and, by extension, their ability to support life and agriculture. 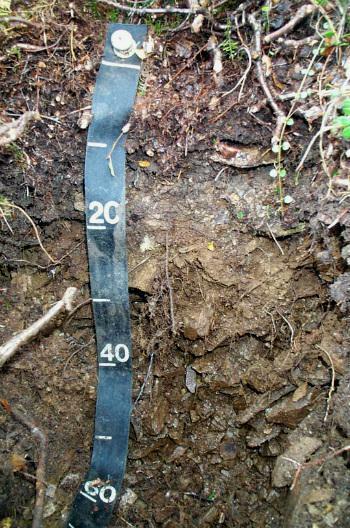 Natural disasters, too, can be deleterious to soils because soil isn’t just dirt. It’s made up of a huge variety of microorganisms that give it the properties we need to grow stuff. So after a major disruption, like, say, the eruption of Mt. St. Helens, the long process of building soil begins again. “I found these beneficial organisms in the fur of pocket gophers and in the feces of elk. Elk will eat these organisms in a source site, which has not been disturbed, and then they’ll wander out and defecate in the area. They’re caring plant seeds and they’re also carrying the beneficial organisms. So you’ve got this little microcosm to start with and then these little islands of fertility begin to coalesce," Ianson says. And that’s one way we can help do a little to protect soil health, by creating, where and when possible, our own little islands of fertile soil. NRCS has four main principles for this, some of which might be more popular than others. Building off of that, another principle is to diversify what is growing from your soil. Leaving living roots entact underground is another winning strategy, as root systems serve as a sort of means of communication between plants. And all of those things are easy to do when you factor in the fourth principle, which is to disturb soil as little as possible. So does all this mean that we have to choose between healthy soil and all of the development that make up modern life? Ianson says no. It just takes a different mindset. And for the non-farmers, addressing our relationship with soil in a different way is another good place to start keeping this delicate resource around for the future. Ianson says we ignore this resource at our own risk. "Not taking care our soil is committing suicide on a species level."